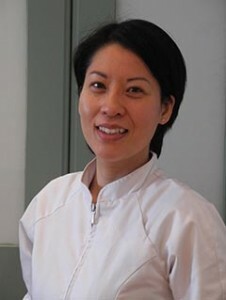 Dr Katharine Chiu is our specialist in prosthodontics who provides patients with expertise in all aspects of smile design and restorative dentistry. Having qualified from London’s prestigious Guy’s Hospital in 2001, Dr Katharine Chiu was offered a position at Guy’s Dental Hospital specialising in prosthodontics and conducted research on tooth wear. Katharine has continued to stay up-to-date by training in the latest dental techniques, gaining a diploma in conscious sedation from King’s Dental Institute in 2006. Katharine is highly skilled and very caring in working with nervous patients. Katharine has worked and taught at a number of UK Dental Hospitals, gaining widespread experience reconstructing failing teeth and mouths with crown and bridgework, dentures, dental implants, veneers and repairing jaw and occlusal (bite) issues. She is also an expert at solving other complex dental issues including advanced tooth wear, restoring missing teeth, designing smiles, improving smiles, stabilising dental health. Katharine is a member of the Royal College of Surgeons of England and is a General Dental Council registered Specialist in Prosthodontics. She is also the elected Chairperson of the British Dental Association (BDA) for 2018 – 2019 Cambridge section. Away from dentistry, Katharine enjoys keeping mind and body healthy by playing badminton and attending ballet classes.